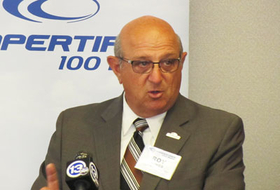 FINDLAY, Ohio—Cooper Tire & Rubber Co. didn't miss a beat on its growth path after its merger pact with Apollo Tyres Ltd. was terminated six months ago. It simply moved on and continued to do what it does best: build its business, develop innovative products, and manufacture and sell high quality tires, according to Roy Armes, chairman, CEO and president of the company. Cooper's goal is sustained operating profit of 8 percent to 10 percent, and its long-term goal is to reach 10 percent annual operating profit and $5 billion to $6 billion in annual net sales. The tire maker posted sales last year of $3.44 billion. Part of 2013 was filled with obstacles that took some determination and smarts to overcome. But the firm emerged in very good shape, Armes said in a recent interview, citing a solid foundation it has established on which it will grow. That has “positioned us for the next phase of growth, which will be driven by continued initiatives to maintain our global cost competitiveness while continuing to expand our footprint and to drive demand for our products around the world,” Armes said. Cooper has expanded its reach with acquisitions in Mexico, China and Serbia in the last several years to give it a stronger position worldwide. Cooper gained cost-effective sourcing of products, with more than 40 percent of its manufacturing capacity now in traditionally low-cost countries, company officials said during the firm's first-quarter conference call in mid-May. He said it gives the company an advantage as import duties from countries such as Brazil, Argentina, Bolivia and Ecuador do not apply to products from Mexico. Cooper's position in China has been strengthened, at least for the time being, now that its problems with Chinese joint venture Cooper Chengshan (Shandong) Tire Co. Ltd. have been put to rest. Cooper and partner Chengshan Group Co. Ltd. are moving forward on a path to determine future ownership of the JV. That outcome will impact specific plans related to achieving the company's future financial targets, officials at the firm said during the May conference call. Cooper is committed to China, both from a growth standpoint within the country and as a source of truck and bus tires produced for global distribution. In June, Cooper Tire Asia relocated its technical operation to Kunshan, China, from Shanghai to place it closer to its Kunshan tire plant. The new 54,000-sq.-ft. facility was constructed specifically for the tire maker's research and development activities and staff of about 65 material scientists and tire engineers. It's a key investment that supports the company's growth in China and Asia, Allen Tsaur, vice president and general manager of Cooper Asia, said when the center was dedicated on June 12. He said the firm's prime focus areas in Asia are passenger and truck tire growth along with expansion of the company's efforts in the original equipment market. Cooper is also upgrading machinery at its Tupelo, Miss., factory—thanks in part to financial support it is receiving from the state of Mississippi and the city of Tupelo—to make the 30-year-old car and light truck tire factory more competitive. That is essential for long-term success, Armes said. He declined further information on the upgrade for competitive reasons. Roy Armes, Cooper chairman, CEO and president. Its recent success—including the firm's strong operating profit in the first quarter of 2014—was not a matter of turning things around but instead building on the solid foundation Cooper had in place, he said. “We did nothing new following the terminated merger; rather, we have stayed the course on our new strategic priorities,” Armes said, and that has continued to drive the kind of results the company is looking to achieve. Cooper has strengthened its foundation over the last several years by improving efficiencies, enhancing its technical capabilities to develop new products and transforming the tire maker's manufacturing cost base, he said. Its cost reduction program, called Project Normandy, has been successful in the U.S. and is being extended globally. The project focuses on four primary cost drivers: deploying automation; standardizing processes to reduce scrap at all sites; decreasing material usage without compromising quality and performance; and efficiencies in distribution. There are some key advantages to platform consolidation, he said: reduced complexity and manufacturing costs; increased sourcing flexibility; improved new product development; and faster product launches, all the while allowing for product differentiation within regions around the globe. Transformation of the firm's production cost base has given it a balanced and competitive manufacturing footprint. Through execution of its strategic plan, Armes said, Cooper has the potential to expand by 17 million to 18 million units at one third the cost of an equivalent greenfield plant expansion.